“Diane,” the first narrative feature from writer / director Kent Jones, is a slice of life drama; driven more by its mood and tone than it is by plot. 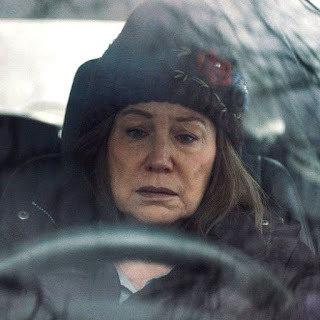 It’s a melancholy film taking place over multiple winters, a time frame made obvious by Diane, the titular character played by Mary Kay Place, being much older by the movie’s conclusion. Jones aptly uses the dreary backdrop of the grey-skied, snowy Northeast to tell Diane’s story as she comes to accept her past and embrace the inevitable. Diane, a widow, spends her time checking in on friends and family. She visits her cousin Donna (Deirdre O’Connell) who is in the late stages of cancer and confined to a hospital bed, serves dinners at a local soup kitchen, goes out with long-time friend Bobbie (Andrea Martin), meets for gatherings with her family, and constantly butts heads with her drug-addicted son Brian (Jake Lacy). As you can imagine, a large portion of Diane’s time is spent driving, a recurring visual motif that helps to highlight the dullness of Diane’s (and most people’s) day-to-day life. Scenes are lit with warm tones, calling to mind the warmth of gatherings with friends and family. Yet, the orange lighted rooms remind viewers that while Diane is in her golden years her life is more stress-filled than it should be. Most of the film’s drama arises from Diane’s turbulent relationship with Brian, introduced at the start of the film asleep on the couch in his dirty apartment as Diane delivers his clean laundry (a seemingly reoccurring task met with a disapproving glance from one friend). The mental stress she puts on herself from worrying over her grown son is exacerbated by his sudden disappearance. The increase in Diane’s anxiety is further worsened by the continual loss of friends and family. As with most slice-of-life films, “Diane” is fairly dull. The moments between Place and Lacy are the most interesting due to the authenticity of their tense relationship. As a whole, the actors do a good job though at times Place’s performance feels forced. Later in the movie, Diane goes to a bar and gets drunk. A scene that’s meant to show the character’s vulnerability instead feels overdone, including an unnecessarily long shot of Diane drunkenly singing and weaving to a song on the jukebox. It’s a cliched moment that probably would have worked better had it not dragged on so long. By the second half of the movie, the movement of time becomes confusing. Long periods pass without much indication, other than fleeting bits of dialogue. How much time has passed between the events displayed on screen? “Diane” moves into some hallucinatory moments by its finale. They don’t mesh with the preceding scenes and feel out of place in a drama that has been pretty straight forward up to that point. Jones’s film is a low-key drama that left me with a “meh” reaction. It doesn’t feel like a complete waste of time but it’s also not one I’d readily recommend. Opens Friday, April 5 at the Magnolia.